The idea of teams having players who are capable of interchanging into different roles has been around since the early sixties. Indeed, it could be argued that the most successful team over the decades – at least those that have had lasting success –have been those sides who have had players that were particularly good at doing this. In the modern era, the man who really revolutionised tactical thinking in this respect was Arrigo Sacchi. Today he is more remembered for his high pressing game that operated clinically thanks also to the supremely talented Dutch trio of Frank Rijkaard, Ruud Gullit and Marco Van Basten. Yet Sacchi’s Milan was much more than that: it was a side that had been coached to function as a whole, with players knowing where to move based on what others did during the game. Indeed, Sacchi predicted that his team had actually only been the start of a tactical evolution that would eventually see teams where players could fulfil any role equally well. His vision of the game went beyond the star individuals and was centred around the strength of the team. For Sacchi, that was what was paramount. Ultimately, his views were seen as being overly extreme – which is why his reign at Milan was relatively brief despite his success – but it spawned a generation of coaches who took his ideas and went to work with them. Today, it is impossible to find a top level coach who hasn’t been influenced by Sacchi’s thinking. Matt Whitehouse is certainly one of the admirers. It could be said that the premise of this book is that of proving Sacchi right; looking over the different tactical evolutions over the past three decades, analysing what kind of an impact these have had and comparing them to his prediction. 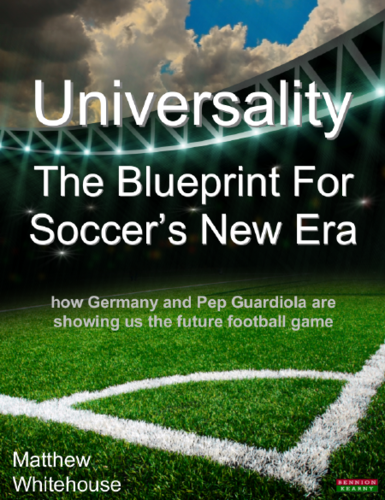 That of analysing the game’s tactical development is a job that Whitehouse has done particularly well here as his most recent book, Universality, highlight how football has evolved to its present state. He isn’t overbearing – there never is a sense of a coach speaking down to others - but it is obvious in the way that he writes that he’s not only researched this subject but also thought very deeply about it. Ultimately, it leaves the reader in no doubt of that Whitehouse sees Sacchi’s prediction becoming reality. Indeed, he has pinpointed Pep Guardiola as the man who not only has the vision to achieve this but, at Bayern, the players that can carry it out. Whether this proves to be the case remains to be seen; far too often in the past tactical innovations that looked set to sweep all before them ended up being overtaken by other developments. However, what this whole book manages to conclusively prove – even though it wasn’t its stated aim to do so – is that the future of the game lies in the hands of those who not only think deeply about the game but who are also capable of shaping future evolutions. Anyone who stands still will be simply left behind. If you’re interested in this book, kindly purchase it by following this link and you will also be helping Blueprint for Football. Full Disclosure: A review copy of Universality was provided by the author.